As evidence of collusion between Russia and Trump’s campaign has piled up, the line of defense has retreated. Maybe Donald Trump Jr. is a wide-eyed kid who made some bad choices, the administration’s allies concede, but his now-undeniable desire to collude with Russia never materialized. “When the meeting happened on June 9, no anti-Hillary information was forthcoming. Veselnitskaya only wanted to discuss a sanctions law called the Magnitsky Act, and claims she never had any damaging or sensitive information about Hillary Clinton,” argues James Robbins in USA Today. Byron York (“Trump-Russia investigation takes sharp turn toward the dumb”) and The Wall Street Journal editorial page (“Keystone Kops Collusion”), among others, offer up the comedy-of-errors fallback. Before delving into these rationalizations, it is worth reviewing just how much ground has already been surrendered. A week after the Russian collusion meeting in Trump Tower, Trump publicly accused the Democrats of faking the hack of its own emails. (Trump: “We believe it was the DNC that did the ‘hacking’ as a way to distract from the many issues facing their deeply flawed candidate and failed party leader.”) Trump denied that Russia interfered in the election at all (“I think maybe the Democrats are putting that out,” he said on RT last September. “Who knows, but I think it’s pretty unlikely.”) Trump has denied throughout that Russia was behind the email hacks. Trump and his advisers and spokespeople have repeatedly made false denials of any contact with Russia. 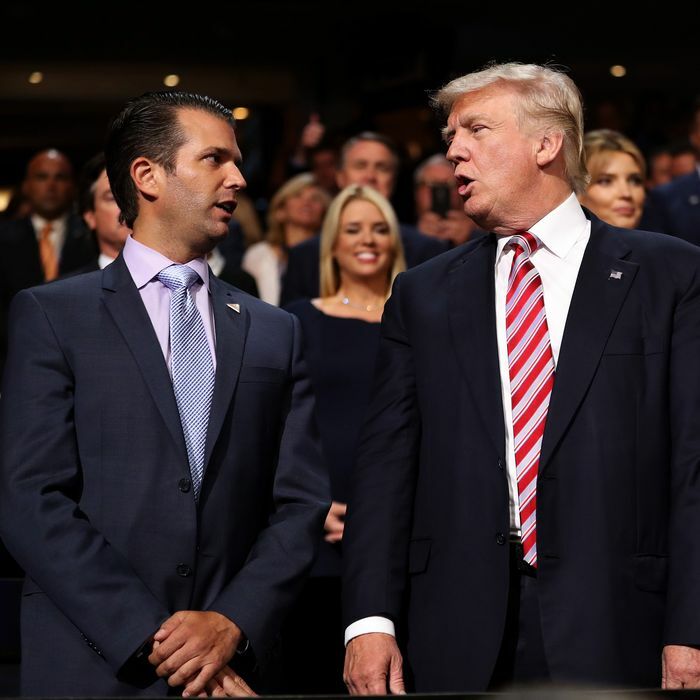 When reports first surfaced of the June 9 meeting, Donald Trump Jr. gave a series of evasive accounts — first portraying it as an adoption meeting — until an email finally surfaced destroying any doubt that he took it with the intent of colluding on the campaign. There was no hacking, Russia didn’t do the hacking, we didn’t meet with any Russians, when we met with the Russians we didn’t discuss hacking. The position of Trump’s conservative apologists is that this time they are probably telling the truth. It’s the law of averages. It’s like a coin came up heads 99 times in a row — the next one just has to be tails, right? When the meeting actually happened, at Trump Tower on June 9, there was a reason Jared Kushner left after a few minutes and Paul Manafort spent the whole time staring at his phone. The “Crown prosecutor” of Russia — there is no such position — was actually a shady lawyer, Natalia Veselnitskaya, who had no “official documents” to offer but wanted to harangue Trump Jr. about U.S. sanctions on Russia. Trump Jr. quite reasonably saw there was nothing there and cut the meeting off after about 20 minutes. So Trump has already delivered one concession closely related to Veselnitskaya’s agenda. He has not eliminated the sanctions regime — which is Putin’s highest diplomatic priority vis-à-vis the United States — but Trump is currently battling tooth and nail to weaken a bill to lock in the sanctions, a bill that the Senate passed 97–2. The Journal mocks the possibility “[t]hat Don Jr. was canny enough to coordinate a global plot to rig the election but not canny enough to notice that this plot was detailed in his personal emails.” At every stage, the Journal and other Trump apologists have leaned heavily on the uncertainty of the facts not yet revealed, while disregarding the importance of every previous defense that has been disproven. Now faced with evidence more damning than anybody could have imagined — a promise of Russian interference on Trump’s behalf, in writing! — the Journal is treating the clarity of the evidence as more reason to give Trump the benefit of the doubt. But maybe, just maybe, there’s a reason for all these lies.